The Contax 137 MD Quartz is a nice little automatic-exposure SLR made by Yashica using the Contax marquee. When it was released in 1980, it was famous for being the smallest motor-driven SLR on the market. The camera uses the wonderful Zeiss lenses made in the Contax/Yashica mount. That in itself is the main reason to buy into this system. Using the text or images on this website without permission on an ebay auction or any other site is a violation of federal law. 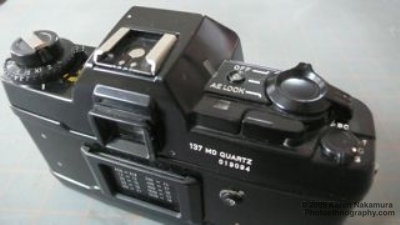 The 137 MD Quartz is aperture-priority only using center-weighted metering. You cannot set your own shutter speed (except for setting it to X-sync 1/60 sec; or B). The chosen shutter speed appears in a vertical scale on the right side of the viewfinder display. You can override the meter by 2 stops over or under if you want. The "Quartz" in the name refers to the fact that the horizontal travel cloth shutter curtain is quartz timed. This makes it much more reliable than mechanical systems, especially in very cold weather. The 137 uses four AA batteries to power the meter and motor drive. The meter turns on when you turn the main control dial to "on" and the LED to the left turns red. It is constantly on while the camera is on. To avoid running down the battery, turn the meter "OFF" when you're not using the camera. Turning the control switch all the way to the right activates the B.C. or "BATTERY CHECK" function. If the batteries are good, the LED will turn green. Using the text or images on this website on an ebay auction or any other site is a violation of your terms of service. The relationship between Yashica and Contax apparently began in 1973. After the failure of the Contarex (see my page on the Contaflex), Zeiss had retreated from the SLR market. It had great lens designs, but their all-mechanical bodies were not competitive with the latest Japanese electronic SLRs from Asahi Pentax, Nikon, Canon, and Minolta. Yashica had some good inexpensive SLR bodies (see my pages on the screwmount J-7 and TL-Electro), but wasn't famous for its lens designs. It was a match made in heaven. 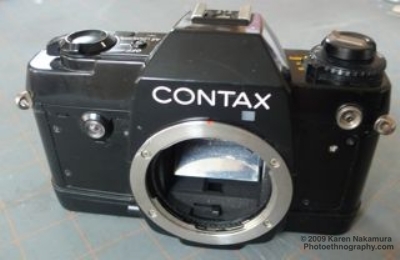 The first SLR, the Contax RTS was announced two years later at the Photokina in 1974. It was revolutionary with a beautiful body design by Porsche Design. General sales began in 1975. The new Contaxes used the Yashica SLR's bayonet mount. 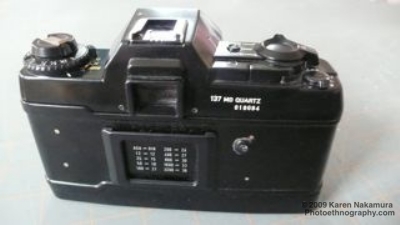 This was named the Contax/Yashica mount (abbreviated C/Y Mount). Yashica continued to produce SLRs under its own brand name with the C/Y mount, this means you can buy into the Contax line very inexpensively through the Yashica route. In March of 2005, Kyocera announced that it would cease production and sales of film and digital cameras under the Contax marquee. Thus ends 30 years of a wonderful camera line. Stood for "Real Time System"
Contax RX 1993 Built-in focusing aid "Digital Focus Indicator"
One of the things about the Contax SLRs that you have to get used to is that the shutter-speed dial is located on the left side of the body -- where the ISO film speed dial usually is on other SLRs. Since you usually operate the camera in aperture-priority mode, this isn't a big deal and you quickly get used to it anyway. 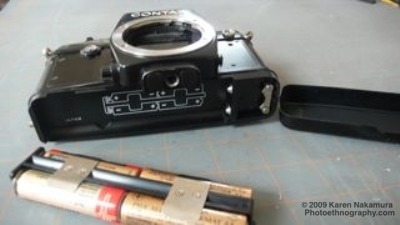 The Yashica/Contax mount is a bayonet design with a throat width of 48mm and flangeback of 45.5mm. This allows for the design of a broad range of wide-aperture and telephoto lenses. 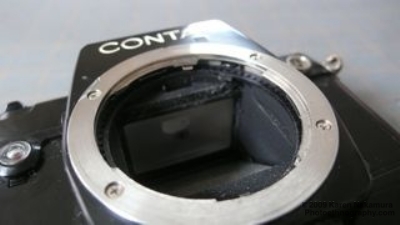 However, Zeiss prevented Kyocera from developing auto-focus lenses for the Contax series - arguing that the lightweight composite lens barrels necessary for auto-focus systems would not be able to hold the lens elements as rigidly as the Zeiss specs allowed. Kyocera first got around this by developing the RX which had a focusing aid built into it, based on the AF mechanism on other SLRs. The only difference was that the user manually turned the lens in the direction that the AF-aid indicated. This was a godsend to photographers with bad eyesight. Then Kyocera came out with the AX which allowed auto-focus by building a movable film box. Basically the internals of the camera moved, instead of the lens. This resulted in a larger camera (although not that large compared to an EOS 1 series or Nikon F2), but it worked. Kyocera had a pretty good thing going with the Contax series, except for the lack of auto-focus. But they wanted auto-focus badly and so when Zeiss finally authorized it, they went whole-hog. Unfortunately, they bungled the transition badly. The new auto-focus N lenses for the Contax N series (N1, NX, ND) were incompatible with the Contax/Yashica bodies. A pro had to buy into the new line entirely. At this point, most pros gave up and either kept their older Contax SLRs or went with the Canon or Nikon systems which were fully AF compatible (Canon having made that break over ten years ago). I bought this Contax 137 MD from a dealer in Japan who was selling it incredibly cheaply (for the Japanese market) because the leatherette had deteriorated. For some reason, Yashica used a leatherette on its cameras that is singularly distinguished for its ability to turn to dust after two decades. CameraLeather.com will re-cover your body for you, or you can buy a kit from them. They're very good, I've been really happy with them. Or, you can buy leatherette from someone like Micro-Tools.com and cut it yourself. Or, if you're feeling really cheeky, you can buy a cheap alligator leather handbag at a Goodwill thrift store and use that instead. I ended up listing the camera on ebay in April of 2009 because I never got around to re-covering it and never bought any Contax lenses for it after all. Note: Using the text or images on this site in an ebay auction without permission is a copyright violation as well as violation of your ebay Terms of Service. I will report you to ebay if I discover such a violation taking place.